Walk around the ruins of one of the great cultural centers of the Hellenic world. 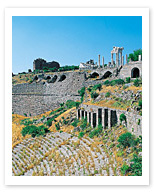 In ancient times the city now known as Bergama was known as Pergamum, and was the capital of an empire. A short anecdote may suffice to give an impression of the scope of this city’s cultural heritage: Egyptians in Alexandria, fearing that the library of Pergamum would one day rival their own magnificent collection, cut off the supply of papyrus from the Nile. In response, resourceful scientists here developed pergamen, a type of parchment made from hide rather than seeds, and proving that necessity is indeed the mother of invention. Other testaments to the glory of this ancient city abound in present-day Bergama, a truly breathtaking site with ruins scattered dramatically about the top of a steep and imposing mountainside.